Heir of Light is a visually-stunning action RPG from Gamevil. Its fast-paced battles will keep players hooked for hours. The game focuses mainly on battles so there’s no exploration involved. This unique feature makes it very attractive to impatient gamers, especially those who just love boss battles. Players have to build a party of four characters and jump into action. Heir of Light’s main character, aka Master, plays a crucial role in battle. A team can’t be built without a Master and so you will have to choose one when the game begins. Once you select a master, you can choose “servants” or subordinates who will fight alongside your main character. There are five masters, of which two are locked. You will have to clear chapter four’s light and dark element quest to unlock the fourth and fifth characters. Since you won’t have any control over your main character’s movement, your sole focus should be his skills when you are choosing a character. Your master and servants’ skills play a very important role in battle. As your party will automatically attack an enemy, you must tap their skills from time to time to deal more damage and eliminate him as quickly as possible. If you have just started playing, then make sure you recruit a character whose skills are pretty effective against an enemy. 1. The servant should possess a combo skill. It’s usually the third skill and most 3-star characters have it. You may also find this skill in some 2-star characters. On your home screen, tap Characters and then tap a servant’s portrait. Next tap the “Skill” tab to check whether he/she has such a skill. A combo skill has special marks – primary mark and secondary mark. You can see the primary mark embedded on a skill in the info screen. 2. The primary mark of a servant’s combo skill should be the same as the primary mark of the Master, i.e. the main character. You can check a master’s marks when you are building a party i.e. selecting four characters before battle. You can also check a master’s skill marks by tapping Characters > Skill and then tapping one of his active skills. 3. When both primary marks of both the master and the servant’s combo skill match, a line connects between them, suggesting that combo skills can be activated. You can see such a line in team selection screen. 4. To activate a combo skill, the third skill gauge of a servant must be full. It takes some time for his combo skill bar to fill up. Once full, tap it to cast a skill and both master and servant will unleash a combined attack on their enemy. Now that you know how to get combo attacks in Heir of Light, let’s learn how to activate a chained combo. When a chained combined skill is activated, the master and several servants unleash attacks simultaneously. Pulling off a chained combo is not as easy as activating a combo skill. You can activate it when servant 1 is performing a combo skill with his master and his secondary mark matches with the primary mark of another servant. You can check any servant’s secondary mark by tapping the skill tab and then tapping his/her combo skill portrait. Once you check this, just make sure the primary skill mark should match with another servant’s secondary skill mark to achieve a chained combo attack successfully. You should equip runes to the master or a servant if you want to improve their key stats, such as DEF, ATK, HP and SPD. You can get runes as rewards when you complete a stage. Just tap a tile on the world map and then tap the “Reward List” button to check what runes you might be acquiring after beating a stage. You can also acquire them by completing quests. On the world map, tap “Quest” on the left side of the screen to get a big list of tasks and complete them to get runes. To equip runes to your master or servant, tap “Characters” and then tap a portrait of a character. You will see a rune map on the right side of the screen and a list of runes underneath it. Runes are categorized into different sets such as Life, Beast and Havoc etc. Tap on a set and then select a rune to equip it. Note the shape of a rune and the shape of empty slot on the map. A square shaped rune will go to the empty square shaped slot. Once equipped, you can replace it with another rune of the same shape, but you will have to spend a whopping 10000 gold to remove the older one. I wouldn’t recommend changing runes, especially if your current rune is enhanced and additional stats are unlocked. However, you might be tempted to replace it if a newer rune is rarer than the old one or you want to complete a set. And if that’s the case than you can just replace your equipped rune with the new one by tapping the new rune. A warning will appear on the screen informing you that if the selected rune is equipped, your current rune will disappear. Tap yes and your new rune will replace the currently equipped one. This way, you won’t have to spend gold, but do remember that the old rune will vanish and that will be permanent. When you enhance a rune using gold, you increase its primary stat (the first stat) value. For example, the “Ruthless Life” hexagon shaped rune’s primary stat is HP and enhancing this rune will increase HP value. However, this rune also has a secondary stat (DEF), but the value won’t increase as secondary stats can’t be enhanced. 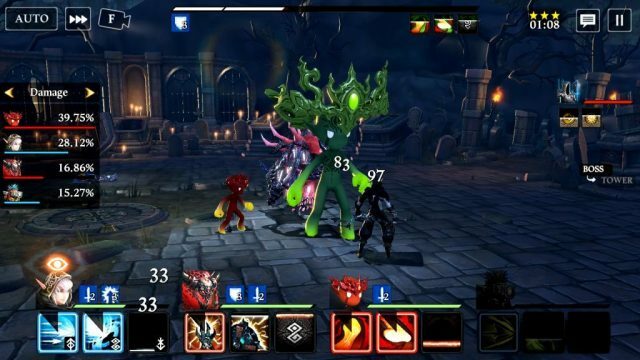 You can, however, unlock additional stats such as effect resist, crit rate etc, by enhancing a rune to certain levels (more on this is explained in point no. 6). Each rune belongs to a particular set and each set has a unique mark which is etched on a rune. The mark of a heart on a rune suggests that it belongs to the life set, the mark of an eye suggests that the rune belongs to the “Skill” set. You will have to collect a certain number of runes to complete a set, and this will grant you a bonus effect. However, there are certain prerequisites, such as all runes must be of different shapes and there should be a certain number of runes to complete a set. However, the number of runes to complete a set may vary from one set to another. For example, if you have 2 life runes, you will complete a Life 2 Set and get 15 percent HP boost when you place them on empty rune slots of a character. For the Beast runes, you must collect 4 uniquely shaped runes with a beast mark on them to complete a set and increase your character’s ATK stats by 35 percent. When you enhance runes, you not only increase the value of a primary stat, but also unlock additional stats. These bonus stats are added every 3 levels. 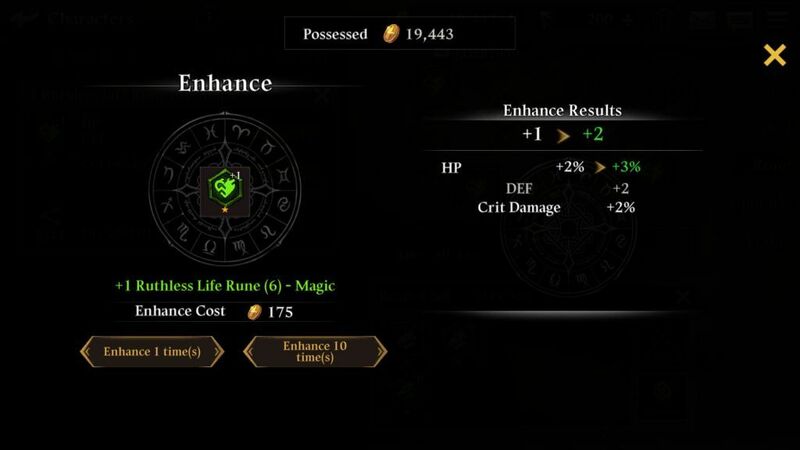 So for example, a grey rune’s bonus stat will be unlocked when you enhance it to level 3 and it will turn green. Enhance it to level 6 to unlock another stat and your rune turns blue in color and becomes a rare rune. You just require gold to enhance a run and unlock bonus stats. Like most RPGs, Heir of Light has five basic elements: Fire, Forest, Water, Light and Dark. Each element is stronger/weaker than the other. When you recruit servants to your team, note the arrows on the lower left bottom of their portraits. Green arrow suggests that you servant’s element is stronger than your enemy’s element. A strong elemental advantage over your enemies suggest that your characters will have an edge over them in battle and winning against enemies would be easier. As you keep exploring and conquering lands, you will face more dangerous and hard-to-beat bosses. Pre-battle preparation is key to stand tall against giant monsters and demons. You should consider learning new passive skills using points acquired by leveling-up your master or purchasing them using Karats (premium currency). Every time your main character levels up, you gain a skill point. You can see the total number of points under a master’s skill section. It’s right there, on the bottom of the screen. Passive skills have permanent effect on your main character’s (Master) stats, so you should invest some of your skill points to learn a passive skill. Tap the “Passive” tab under a master’s skill and then tap a skill that you want to learn or upgrade. Next, tap the plus button that appears below a passive skill’s portrait to allocate skill points and press the save button. Don’t forget to improve a master’s active skills. You can allocate half of the points to key active skills to make them more powerful. Tap the “Active” tab and then tap a skill. A set of new passive skills linked to the active skill will show up on the left side of the screen. Allocating points to the most devastating active skill to make it more powerful.